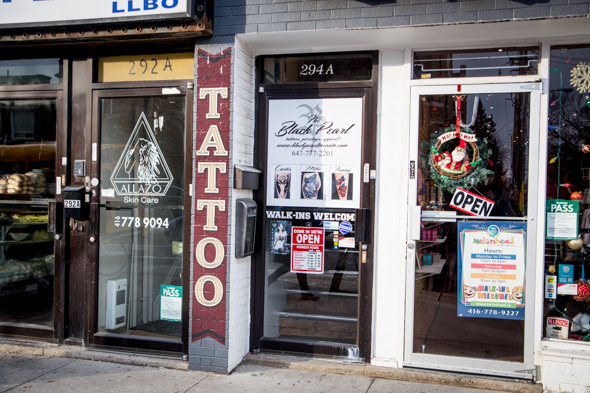 The Black Pearl Tattoos and Piercing is a tattoo shop in a hidden second-storey location on the Danforth. Chances are, if you live in this family-friendly neck of the woods, you've been somewhat Disney-fied - so forgive me if my mind immediately drifts to pirates and buried treasure at the mere mention of the name. While there are no scallywags in sight, the other part of this image is pretty clear - this shop is a buried treasure in the east end. I mean that literally. The second floor shop is not easy to spot. In fact, it turns out I've been wandering by it for months without noticing it was there. A subtle sign hangs above their doorway, and had I not been looking up instead of down at my phone, I doubt I ever would have noticed it. As I climb the stairs and round the corner, I'm greeted by a hive of activity. There are people everywhere. Like first impressions of a good restaurant, I surmise that this place must have something going for it based on sheer numbers. Despite the hectic atmosphere, I'm welcomed by a very friendly receptionist who asks politely if I have an appointment. I tell her I'm a writer doing a profile of the shop and am immediately introduced to the shop's owner, Mike Storey . When we sit down to chat, we're joined by the other two artists who call the Black Pearl home - Tommy Oh and Curtis Montgomery . Obviously busy, they make time to talk about what they all love. Their enthusiasm is more than evident. Having worked in several shops (most notably Adrenaline), The Black Pearl is Mike Storey 's first foray in to ownership. 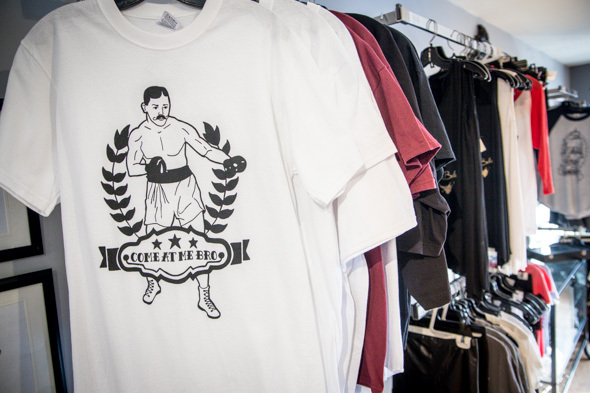 "When I first opened the shop last April I literally had no idea what I was doing," says Storey. "I never owned a shop before but now I notice things like the signage outside. I walk by at night and I can barely see my own sign. Its all trial and error. It just takes time." "Mike knows what he wants and what he doesn't want," adds Oh. "I've been lucky enough to work here. 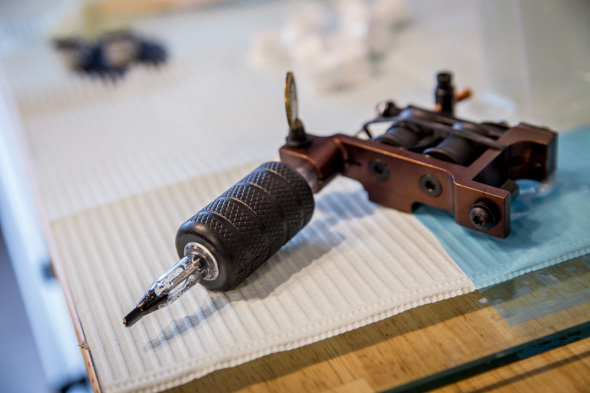 As a tattooer, you're always looking for the right space and the right environment." It's clear that the Black Pearl is it. An open studio space, its bright, airy and inviting. The three artists sit in close proximity, a situation they're all happy with. "It's motivating to see all of us work and produce things that didn't exist before," Storey says. 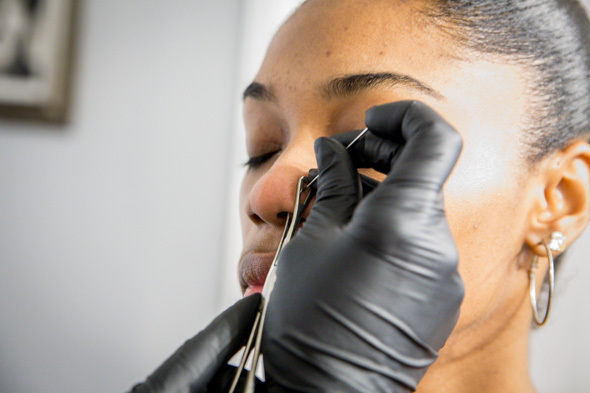 "Clients are talking and we can all just have fun. Everyone feels comfortable, every one is laughing." Oh agrees: "It's cool for the creative process as well, 'cause you can chuck ideas around. If I'm thinking of trying something I haven't already done, these guys are there." 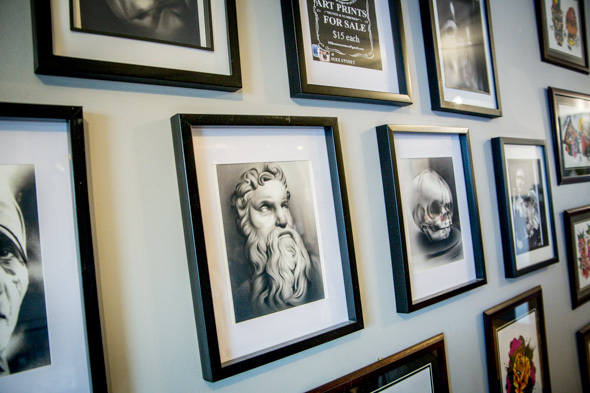 Highly regarded for his stellar black and grey realism, Storey has not only built his shop around that solid reputation, he has surrounded himself with two uniquely talented tattooers in their own rights. "Tommy is an illustrative monster and Curtis is a talent that if I wouldn't have picked up, some one else would have," Storey says proudly. "How do you pass up talent like that?" That talent is on full display in the flash that lines the walls, the result of persistent drawing. With lots of one-of-a-kind pieces to look at, you can be assured that your eyes will be kept busy. In fact, The Black Pearl is currently promoting that work with $60-100 flash days on Fridays and Saturdays for the foreseeable future. "It all started on Black Friday," says Storey. "We literally promoted it on Instagram and Facebook, like, the night before and it was jammed." Adds Montgomery: "We have a good number of followers on the shop's Instagram so I feel like people were just waiting for it. It booked up so quickly." "It's a massive compliment because this is all of our stuff on the wall. Its not Sailor Jerry stuff or stuff ripped off Pinterest," adds Oh. "To get people through the door and have confirmation of what we're doing is a great feeling."